Fertilizing our house plants with urine seems to be working great, but once Mark started bottling his pee, I realized that we had too much of a good thing. What to do with the extra? Urine is so high in nitrogen that one of its best uses is mixing with high carbon compounds to create a C:N ratio more suited to decomposition. Although I use large cardboard boxes for kill mulches as soon as we get them (sometimes emptying out components early to get to those important boxes), small cardboard boxes tend to pile up, waiting for a use. Time to see if we can compost them with pee! Following the lead of someone mentioned in Liquid Gold, I filled a plastic bin with cardboard, making sure that the cut ends all faced up. By laying the cardboard vertically in the box rather than horizontally, I made it much more likely that urine will soak down into each layer and get to work rather than puddling in the top few layers. I didn't want the cardboard to get waterlogged, so I figured I could either put holes in the bottom of the bin and put it outside, or leave the bin intact and move it out of the weather, and I chose the latter. The final step was to pour a gallon of urine over the cardboard. I'll try to remember to check on the bin at intervals and pour on more pee if the cardboard seems dry, but otherwise I'll just leave the decomposition chamber to do its thing and report on the experiment in six months to a year. Make a comfortable living in just a few hours per week using the tips in our $2 ebook. Around here a plastic bin full pee-soaked cardboard will not fly, and I'm even realizing a sense of my wife's antipathy for some of my stranger permacultural experiments. But it's got me thinking: What would happen if I dug a hole and filled it completely with a large roll of carboard covering lightly with soil and soak that periodically with urine? "...antipathy for some of my stranger permacultural experiments..."
I think your hole full of cardboard would be a great idea. Or just put it in a compost pile and pour the urine on periodically. I can already tell the difference in our compost pile where I've been throwing the extra urine. As always, reading a new post, I've followed links to older and older ones. Can you give an update on the pee composted cardboard? Thanks! Dave --- Good question! Not so successful for this experiment (although not terrible either.) I put the bin of cardboard out of the rain and it dried out and just sat there, so I eventually used it in a kill mulch. 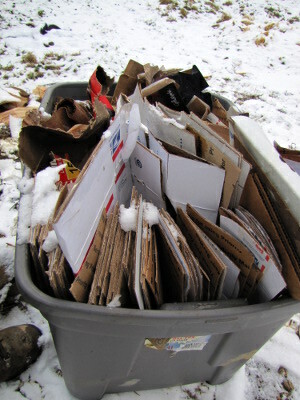 I suspect that if I'd found a way to keep the cardboard damp, it would have decomposed much better. But I always need kill mulch material, so it was probably all to the good!